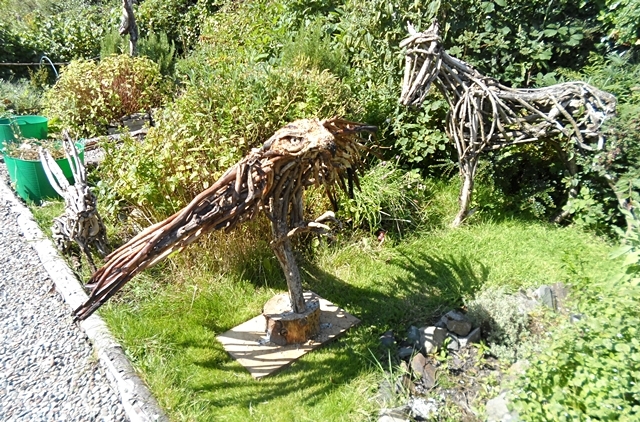 I am delighted to have been commissioned to produce a series of sculptures to go on permanent display at a local nature trail. 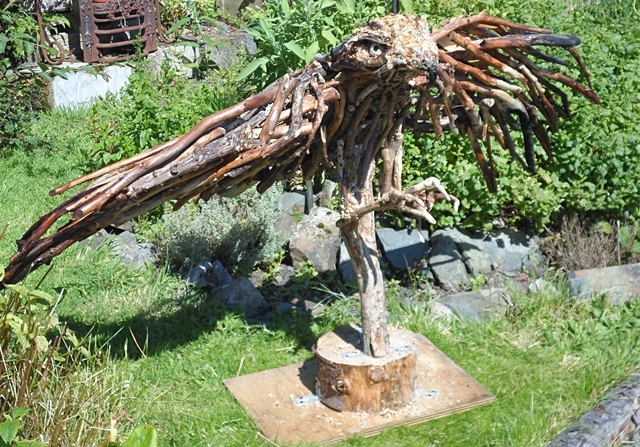 The recently completed Frugaldom owl has proved very popular so I have decided to start the series with a Red Kite in a similar pose to be positioned, like the owl, on a neglected tree stump. 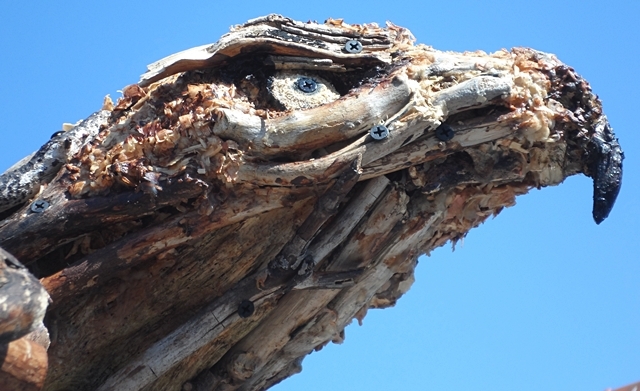 The site for this particular sculpture is quite high up so the Red Kite will be viewed from below. 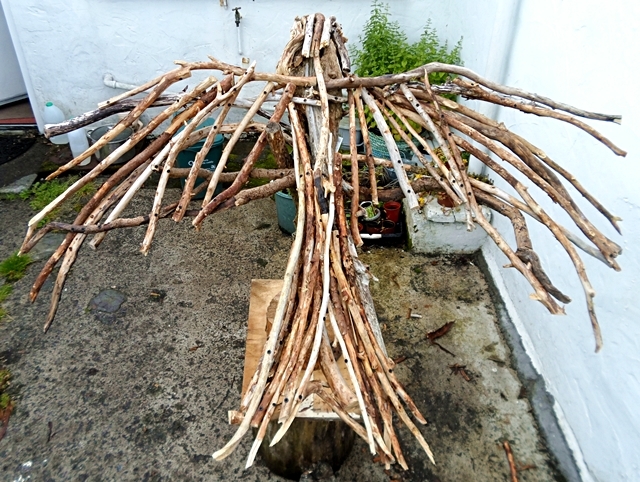 I started with a fairly simple cross shape to form the framework for the bird. I have put it on a sturdy temporary stand at a suitable height for working while still being able to view it from underneath. 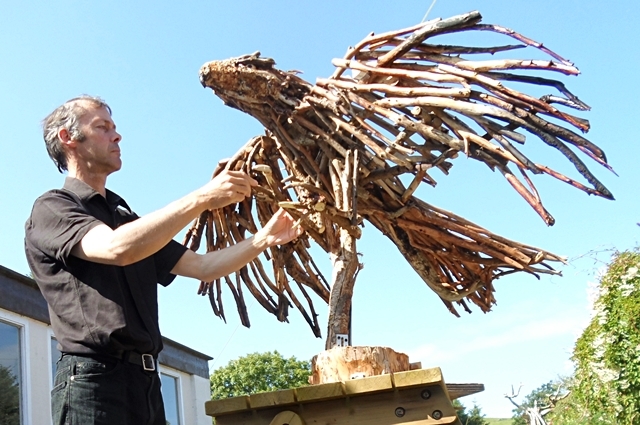 The Red Kite has a very distinctive tail and each of the wooden strips (or wing feathers) help to strengthen the sculpture. 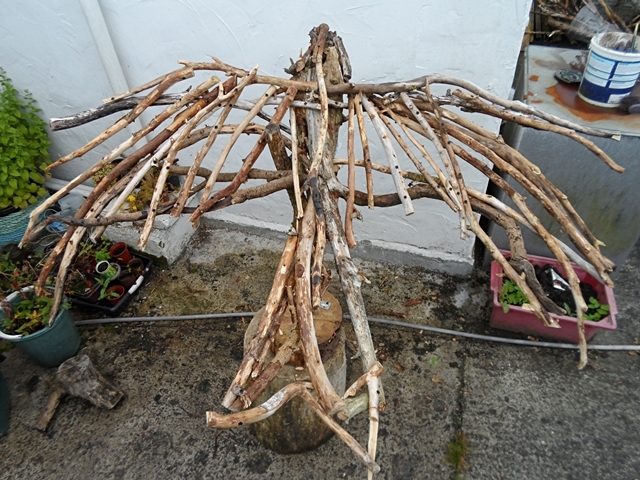 The wings do not have to be a mirror image of one another but it obviously helps to keep them balanced as the sculpture progresses. 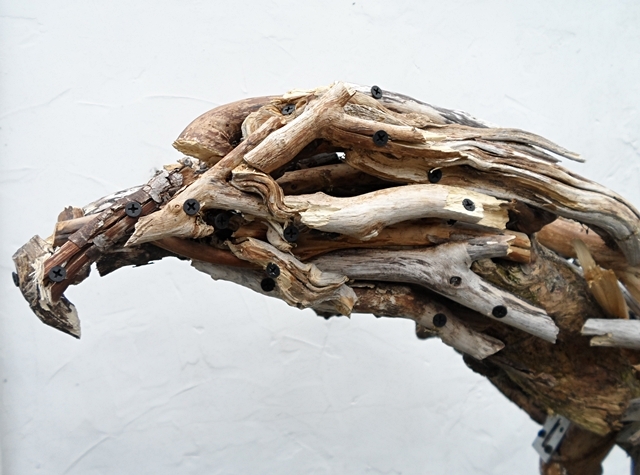 I have not decided exactly how to tackle the head of the bird but have started adding a few gnarled pieces of wood to suggest the shape. 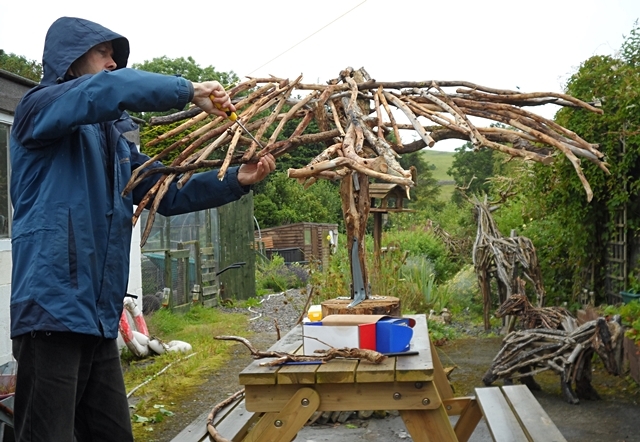 The sculpture is a little over four feet wide so it is much better if I can work on it outside the studio, even in miserable weather! Gradually thickening up the fan tail of the bird. The longer the strips the better as they can extend through the body and add strength to the sculpture. 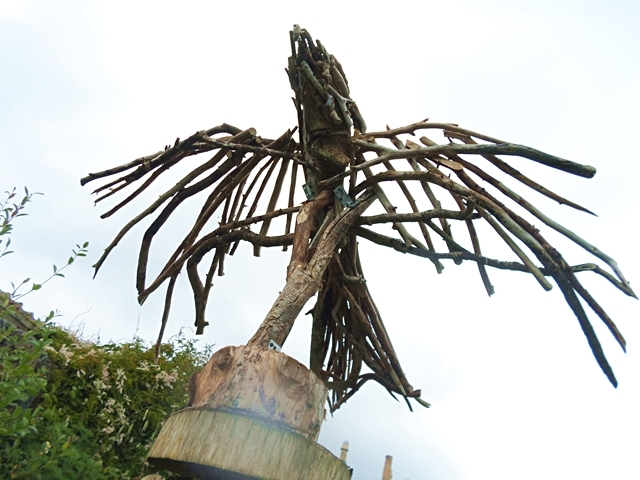 The original framework has now been virtually filled in and the main body of the bird is almost complete. After much deliberation, I decided to carve the eyes rather than leave them hollow. Just adding the finishing touches, fortunately in much better weather! 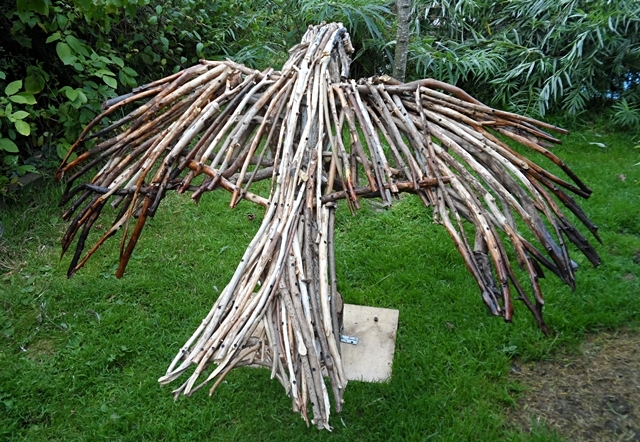 The Red Kite is now complete, apart from a protective coating of varnish, and is temporarily residing in the Ecoarts garden prior to being transported to the nature trail. 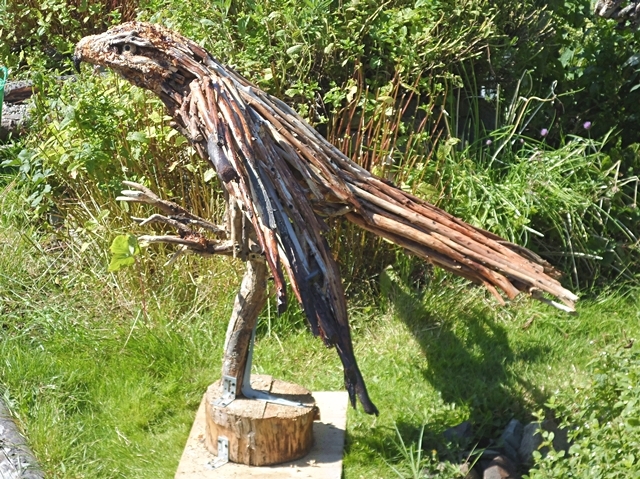 This entry was posted in Sculptures, Wood and tagged Animal sculptures, bird sculptures, Nature Trail, Red Kite, wood sculptures. Bookmark the permalink.